Mark’s colleague, Richard Blackford (composer and conductor) had already left the RCM some time before to assist and study with Hans Werner Henze in Italy. Richard was asked to find a group of British musicians to participate in Henze’s new music festival, ‘Cantiere Internazionale D’Arte’, Montepulciano, starting in July 1976. Mark was asked to bring his double bassoon as well as his bassoon for the first performance of Henze’s reworking of ‘Don Chisciotte’ by Paisiello, which Henze produced and conducted himself. Many prestigious performers took part over the years starting with Ricardo Chailly (for several years), Julian Bream, Peter Maxwell Davies and others. Soon after came Denis Russell-Davies, Guiseppe Sinopoli, George Malcolm, Mara Zampieri, Sandor Vegh, Marcel Marceau, Christobal Halfter, Elgar Howarth, Williams Forsythe …. etc. 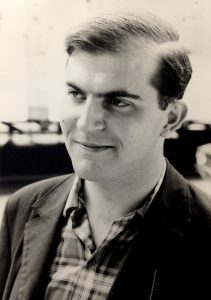 Henze invited Mark to conduct as well as play from the second year 1977 and he was given many first performances to conduct. The same year Henze wrote his wind quintet, ‘L’Autunno’. He included bassoon and double bassoon cadenzas especially written for Mark to play. The first performance took place on the 28th of February 1979, followed by European tours and an LP recording in 1983. Mark conducted the first London performance of Henze’s 3rd Symphony on 15th March 1980 (St John’s Smith Square /YMSO) to great critical acclaim in the Guardian, 17th March. His return to Montepulciano in 1981 brought major progress to Mark’s career. Having played the Italian premiere of Otmar Nussio’s Concerto (‘Divertimento’) for Double Bassoon and String Orchestra on the 1st August, he went on the following day to conduct a major orchestral concert, not only another important Shostakovich encounter (Symphony No. 1), but also a large orchestra consisting of both Basel Sinfonietta (the first month of their existence) and the RIAS Jugend Orchester (Berlin). After their August Montepulciano performances with Mark, Basel Sinfonietta invited him to Basel in October for a concert (including Kurt Weill’s 2nd Symphony), which was repeated in several venues. His position as regular guest conductor was then confirmed. It was soon after that that the RIAS Jugend Orchester (West Berlin) invited him to become their Artistic Director (February 1983 to 1987). 1982 was Percy Grainger’s 100th birthday year. Penelope Thwaites organised a concert, ‘Happy New Year Percy Grainger’ at the Purcell Room, London, for Mark to conduct on 2nd January with a specially formed ‘Elastic Band’. This brought Mark his first encounter with another Old Alleynian, John Amis, who both introduced and sang in the concert.